An artist’s retreat and destination for health-minded people looking for a cure at the area radon mines, the Basin Mining District got its start as a mining camp in the late 19th century. Gold was first found in the region as early as 1862 and a small settlement named Cataract was established at the confluence of the Boulder River and Cataract Creek as prospectors staked claims in the area. However, these first mining ventures were short lived, as miners abandoned their claims for richer diggings on Grasshopper Creek. This would be just the first of a century of fitful starts and stops in what would become the Basin Mining District. Though some miners continued to work the creeks and rich deposits were found about 2 ½ miles further up the creek, the ore was generally too difficult and expensive to work. However, miners persisted and after the easy placer deposits were all but exhausted, many men began to look for lode veins, several of which were discovered in the 1870s. Again; however, no major work was completed due to high operational costs and the lack of an area smelter. That changed in 1880 when two miners named Lawson and Allport started a new settlement called Basin City about ½ mile upstream from the former camp of Cataract. What started as little more than a cluster of cabins began to service the area mining operations as a trading center and in 1880 a post office was established. The few buildings that remained in Cataract were moved to Basin City and soon more buildings were constructed to support significant lodes found at several mines including the Bullion, Hope, Katy, Morning Star Mines and others. At first the ore had to be hauled to Butte by wagon, over some 30 miles of rugged roads. However, when a smelter was built in Basin, the camp began to prosper, but it would be the 20th century before it reached its peak population. 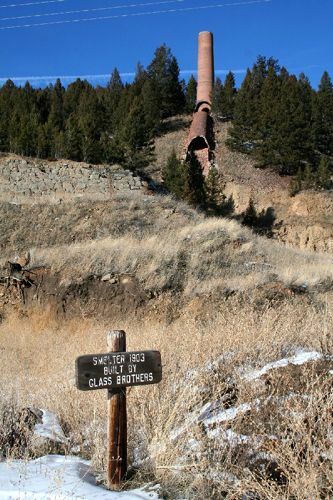 During the latter part of the 1900’s, Basin suffered several fires, especially at the mines, including a blaze at the Katy Mill, which destroyed the hoisting plant and the shaft in 1895, and a fire at the concentrator in the Hope Gold Mine, which killed seven miners in 1896. These fires, accompanied by area flooding and low silver prices shut down both mines by 1896. 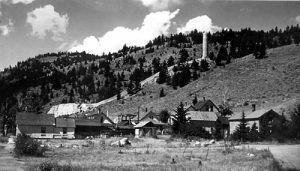 However, in 1905, the Katy and Hope Mines were bought by the Basin Reduction Company who invested some $500,000 in improvement, including equipping a 1500-ton smelter and concentrator which reworked the mine tailings. Before long, the mill was running at full capacity. It was between the years of 1906 and 1910 that Basin’s population peaked at about 1500 people, and the town sported numerous businesses including a hardware store, drug store, a bank, bakery, three hotels, a newspaper, four boarding houses, livery stables, a blacksmith, a sawmill, a bathhouse, a brewery, three grocery stores, several brothels and 12 saloons. The town also sported several entertainment venues including a dance pavilion, a grandstand, a baseball diamond, and a playground; as well as several organizations, a union hall, and numerous churches. This brief boom, like others, would also be short lived and by 1911, the Katy and Hope Mines were shut down once again. 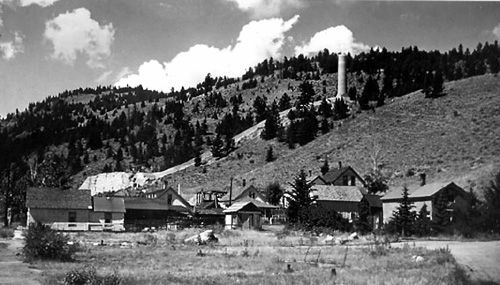 Yet, the town had one last mining boom when the Hope-Katy mine complex was purchased by the Jib Consolidated Mining Company in 1919 and once again, mining began in earnest at the Hope-Katy and also the White Elephant Mine. Digging more deeply, the company produced some $1,700,000 in gold and by 1924, was the largest gold producer in Montana. But, by the following year, the operation was forced to close due to mismanagement and the properties were taken over by trustees and creditors. This signaled the end of Basin’s final mining boom. Since then, only small-scale mining and reworking of old mine dumps has occurred in the area. 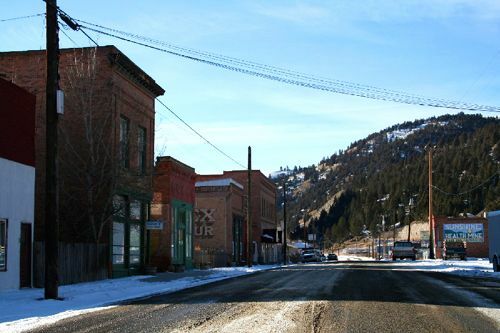 Today, Basin is a small community of just about 250 people that has gained a reputation as an artist’s refuge. In 1993, a group of professional artists created the Montana Artists Refuge in Basin which today sponsors several art events and supports local artists of all types, including painters, musicians, dancers, potters, writers, and more. But, the biggest draw in Basin is its radon mines, including the Merry Widow and Sunshine Mines, which are marketed today for their reputed health-giving benefits. Throughout the area signs of Basin’s prosperous mining days can be seen in abandoned mining equipment, closed mine portals, and the ruins of a smelter and ore concentrator. It’s tiny main street also boasts several historic buildings. Basin is located about halfway between Butte and Helena along Interstate 15 at Exit 156.